The history of Cyrano de Bergerac is also the history of one double deformation: physical, real, obvious, outer one, its nose; an other is the dormation of who, in the comedy of Rostand, it is near, listens to it, watches it, but it does notsee. One optical, inner deformation. But this is the history of Rossana. A concept that one of deformation (in this case of the truth) that it is involved the same author, that on a commission basis writes one heroic comedy of a famous actor of the age, Coquelin, for his abilities, telling the life of the true Cyrano de Bergerac, skillful skilled swordsman, military, writer (of books, less perhaps than letters), but later on philosopher and dancer. It is already something that puts in argument the identity concept: information and deformation. What joins Cyrano de Bergerac and one person to uneasiness on the psychical plan? Both live in the deformation, an outer, obvious deformation, both lead an incessant, bold, sure heroic battle, to the search of one they true identity, both endure the uneasiness that comes not to distinguish in same they, from part of the others, that who informs from that deforms, the appearance and the intimacy, both accept or succumb to an identity or identification that is not them. We have left from the history of the true Cyrano de Bergerac, from the end of its history, the history of its dead women; curious epilogue in which it comes put in argument from some documents the effective place of its interment, contend in this case from two orders of religious neighbors to he in the fatal hour. Particular that singularly the true Cyrano de Bergerac with narcotic premonition describes in a step of its last literary adventures with the phrase: A-t-on trouvé corps de the Cyrano? 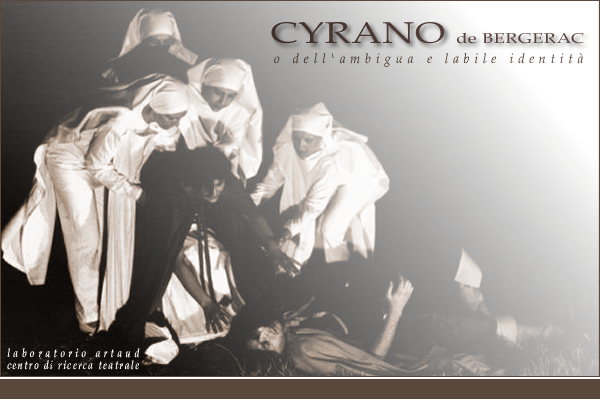 We have left from the information in order to reach to one deformation of the history of Cyrano, from a rituale in order to compose one theater piece, from the truth in order to catch up the fiction.